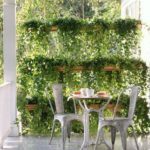 Gutter gardens are an easy way to add a lot of growing room to your garden, by going vertical! 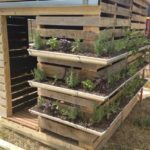 Space is a premium in most city gardens and one of the answers to a lack of growing room is going up. By using gutters to grow shallow rooted plants, you can grow 4-6 times as much in the same space. The easiest answer is that they are readily available, moderately inexpensive, and there is mounting hardware readily available. Personally I am a fan of the K style gutters because of the screw in hangers and flat back. To add to that, gutters can be painted to match your garden and look stylish! 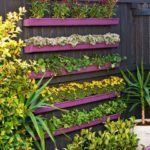 There are a few considerations for planting a gutter garden. Here are the primary things to consider. There are several options when it comes to gutter materials. 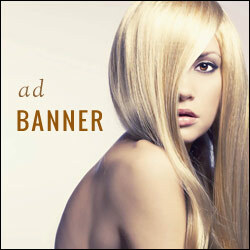 Plastic, aluminum are the most readily available, but copper and zinc coated steel can be found as well. Zinc seems to me would be continually leaching into your soil, so that is out in my book. PVC gutters will work, but they too can leach chemicals into your soil. That leaves aluminum and copper. This will come down to choice and look (and price), but both will hold up for years with no maintenance. Because gutter gardens are not soil heavy I prefer East facing locations that are protected from the afternoon sun. This will avoid drying out plants too fast. Plus, a lot of the things you will be growing in your gutter are not full sun plants anyway. It is obviously important to put some holes in the bottom for drainage. Some people put in gravel or other material to assist in the drainage, but I find that a decent soil with lots of perlite mixed in seems to do just fine. You may want to be more regular about fertilizing your plants in your new gutter garden. The limited soil won’t hold as many nutrients and there is a tendency for it to get washed away. You would be surprised what all you can grow in gutter gardens. Realistically any plant that has shallow roots will work. This obviously negates thing like most root crops, tomatoes and the like. 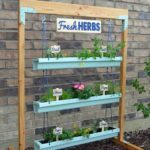 Here are a few ideas of what you can grow. 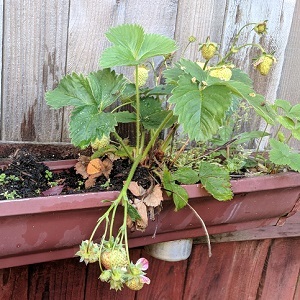 Probably the biggest concern when doing a gutter garden is watering. Limited soil means that the plants can dry out quickly on warm windy days. Locating them out of the direct afternoon sun helps considerably, but be aware that you need to check them more often. 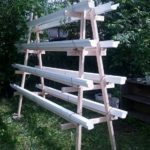 For gardeners that are limited on space, or that don’t want to dig dirt, gutter gardens are a great solution. 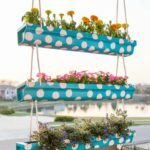 Easy to build and maintain, gutter gardens offer a lot of potential with minimal effort. Even if you have lots of room to plant, I highly suggest you take and afternoon and build a gutter garden of your own to experiment with! 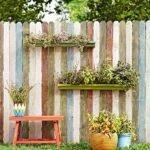 Here are a few examples of gardens you can built with some gutter material and some imagination.